It may only be October, but I’m already thinking of the holidays—or more precisely who I can enlist to look after my sourdough starter when I’m away from home. If it sounds like rarefied foodie speak, let me try to swiftly lift the veil: To make sourdough bread, you need to add an active culture, or starter—a happy balance of lofty yeast and tangy lactic acid in bubbly paste form—to your bread dough. The starter is a living thing and must be kept alive with weekly feedings or regular bread baking…just think of it as a potted plant with a purpose. Let me assure you, the results outweigh the small commitment: your starter will help yield a hearty loaf with tough, fragrant crust and a chewy, aerated interior that keeps longer than your average bread, fills you up more, and is easier to digest. It’s also far cheaper to make your own. I’m not the first human to go to lengths for bread—I think we could even get away with calling it something primal. Just a few months ago in Jordan, scientists discovered what is now the world’s oldest loaf of bread, evidence that humans have been making dough for some 14,000 years. So what sets sourdough apart? Until the industrial revolution in the 19th century and before commercially available yeast in the 20th century, the average loaf of leavened bread in many countries got its rise from sourdough starter and slow fermentation. A single strain could stay in the family and be handed down for generations. In fact, the oldest strain of sourdough in the world resides in Canada and is said to be some 120 years old. Not bad for something that takes just 4 days to come to life. Think it’s about time to start your own legacy? Let's ferment! Before you make your first loaf of sourdough, you need to make your fermented starter (also known as the sourdough culture, starter, or mother). A sourdough starter is a fermented mixture of flour, water, yeast, and lactic acid and acts as the leavening agent when added to a bread dough. The yeast spurs CO2 development to help achieve a rise and give sourdough its signature bubbled texture. Meanwhile, the lactic acid imparts a tangy flavor and breaks down the bran and starches in the flour, which helps to develop the gluten that lends sourdough its lovely chewiness. Traditionally, there is no extra yeast added to a bread dough made with sourdough starter, though you can add yeast when making an express loaf like in our recipe below. Instead, flour and water are left out at room temperature and catch the wild yeast that is present in the air all around us. In his book and Netflix series Cooked, food writer and activist Michael Pollan muses that if we are to believe that much of cooking came about by accident, it’s not hard to see what happened when our ancestors accidentally left some flatbread batter out overnight, only to find it bubbling come morning. What types of flour are best for making sourdough starter? You can use most types of flour to make your sourdough starter, however the best kinds to use are dark or wholegrain rye flours, stone-ground flours, strong bread flours, or whole wheat flours as these fibrous flours contain the most for the yeast to feed on—including the bran and nutritious wheat germ. Don’t think the initial choice will limit you down the road: The type of flour that you use for your starter doesn’t determine the kind of flour you use for your future loaves, you can use rye starter for a white or spelt loaf and so on. In fact, one of the most enjoyable things about making sourdough is experimenting with different types of flour in a loaf to lend different aeration, texture, and flavor. However, gluten-free flours won’t yield the traditional results of sourdough as it’s the developed gluten that gives sourdough its aerated, stretchy appeal. To understand the different flour types once and for all, read our useful guide on the subject. Before you begin, you’ll need a set of digital scales, a large glass jar, a piece of cheesecloth and a rubber band. The ingredients are even simpler: one of the above-mentioned flours, filtered water… and time! We recommend using filtered or bottled water as the chlorine in tap water is no friend to healthy yeast growth. Alternatively, leave a a mug of tap water out overnight, uncovered, and by morning most of the chlorine will have evaporated and it can be used to create a new starter. 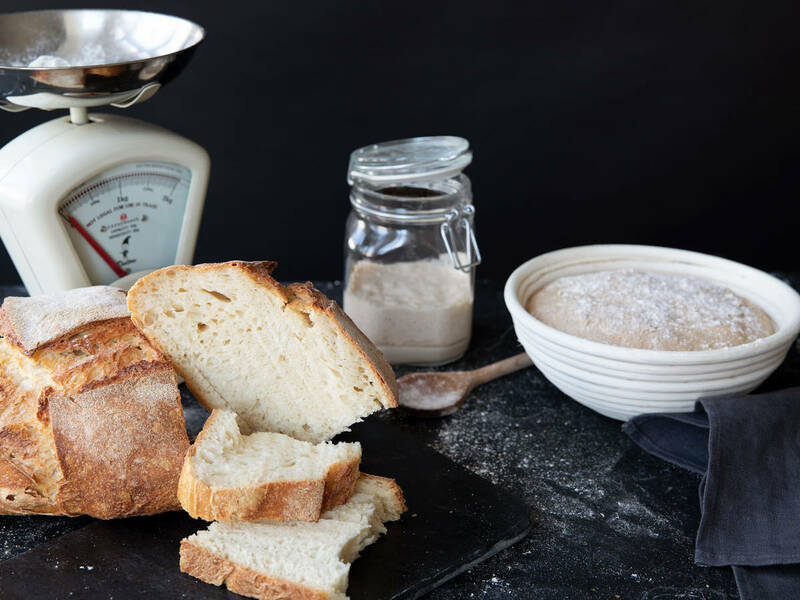 Room temperature is important here: Sourdough starters like a temperate climate that is not too cold, and not too hot, around 75°F – 86°F (24°C – 30°C). If your house is cool, use warm water (about 86°F/30°C to give your starter the best chance), and if it’s very warm, use cool water. Keep it out of drafty places and likewise don’t put it on the radiator. At one sourdough workshop I attended, we were amusingly encouraged us to always use our hands when making sourdough, something I continue to happen upon in my sourdough research. There is evidence that the bacteria on human hands actually helps sourdough along, so use your finger to mix up your flour and water feed each day before you feed your sourdough starter. Hands should be washed with mild soap, but not directly before mixing to avoid any chemical residue—simply go about your business in the kitchen and then begin. If after 4 days you haven’t yielded the right results, or if over time you’re concerned about your starter not being quite right, all is not lost. If clear liquid settles on the top of your starter, fear not. This liquid is called ‘hooch’ and can simply be poured off. It’s a good idea to spoon off the top layer of the starter underneath, too. Feed your starter and rest easy. If you see any dark spots of mold, it’s a good idea to throw it away and start again. This means that the yeast and bacteria have not been able to create a balanced, active environment which may be due to temperature, insufficient feeding, or low-quality ingredients. Just because your starter doesn’t look like the honeycombed structures you see in handbooks or online doesn’t mean it’s not worth keeping. If you keep your starter in the fridge, fermentation happens more slowly and, most likely, while you’re sleeping, meaning it will rise and fall unbeknownst to you. Experiment by giving your starter a hearty feed, leaving it somewhere warm instead, and checking on its activity. Just remember to put in back in the fridge afterwards. Don’t let fear of failure hold you back. Instead, consider the words (and instructions) of master baker and author of Do/Sourdough: Slow bread for busy lives, Andrew Whitley: “You may be wracked by guilt and feelings of failure, but steady on: such emotions are needed elsewhere in your life and shouldn’t be frittered away on a ferment.” He recommends for a whole-grain rye starter, taking 1 oz (30 g) of your ‘sluggish starter’ pouring it into a new receptacle and feeding it with 3 oz (90 g) of whole-grain rye flour and 6 oz (180 g) of water. This should be left at warm room temperature for up to 24 hours and then treated as your main starter. The ‘sluggish’ starter can be added as a flavor improver to other baked goods (more on that later), rather than being thrown away. The right texture depends on the flour used. A wheat-based starter should be the texture of a thick batter, while Andrew Whitley recommends a thinner texture for rye-based. What does ‘feeding’ sourdough mean? As your sourdough starter ferments, the microorganisms consume the starch in the flour, which has been converted into sugar. At a certain point, there’s nothing much left to feed on, which means you need to literally feed your sourdough with more flour and water. If left at room temperature, where it will ferment more quickly, you’ll need to feed your sourdough starter once or twice a day. We only recommend storing it at room temperature if you’re baking every day or every other day. If baking less frequently, keep your sourdough starter in the fridge where it will ferment more slowly and only need feeding once a week. Roughly 24 hours before you intend to start making a loaf of sourdough, you need to refresh or feed your starter to make sure it’s active enough to let your dough rise and shine. This step is usually accounted for in the recipe, or alternatively, you can follow the feeding steps below. Feed your sourdough starter equal parts flour and water once a week. If you’re not baking regularly, it’s a good idea to remove some of the spent starter (i.e. that’s already been gobbled up by the yeast) …to make way for new life in the form of fresh flour and water. A good rule of thumb is to put back double the amount removed (here’s where your scales come in handy again) in flour and water. Say, if you remove 1 oz (30 g) of starter, you would then add 1 oz (30 g) of water and 1 oz (30 g) of flour back in. What happens if I add yeast to my sourdough? If you are particularly short on time, you can buy ready-made sachets of sourdough or add yeast to your own sourdough bread dough to help it rise quickly. Though you won’t get the same benefits as you would from slow fermentation, you will still end up with tangy, chewy bread and a good crust. Try baking it in a Dutch oven to further enhance the crust. You can a couple of tablespoons or more of your sourdough starter to pizza, pancake or crepe batters, and even to cakes. It can act as the sole leaven, work in combination with yeast, or simply add a tangy, base note. If you’d like to learn more about sourdough, here are a few books that give excellent instructions for making sourdough at home.